FOUND BLOG News Happy Holidays Night! Count it down folks! It’s just over a week until our Happy Holidays Shopping night in store. 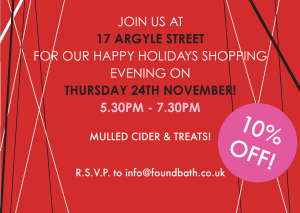 See you from 5.30pm for mulled cider and mince pies galore!